Missing Baseball in the dead of winter is the worst thing in the world. I'm left to daydream of batted balls, snagging fly's and tagged out runners while the sky darkens with the treat of a cold rain. Heck, sometimes I find myself window shopping online in hopes of finding a unique photo to remind why Spring is so eternal. It's like their a symbol that the new year will truly be reborn once again, and that Baseball will begin anew. Featured above is a vintage press photo I scoped out on eBay of Brooklyn second baseman Andy High tagging out infield prospect Fred Johnston down low. It was taken during a Spring training workout in Clearwater, Florida on 3/9/1924 by Underwood & Underwood. Via Eric Stephen at True Blue LA, "Dodgers 2015 projections & fun with The Bill James Handbook." Starting Jan. 1, your Time Warner Cable bill is going to get a little more expensive, with the addition of a “sports programming fee” of $2.75 a month. The charge is modest, but remember a lot of your cable bill goes to sports already, to pay hefty carriage fees to ESPN and an increasing number of regional sports networks (RSN's). Alex Markle at Chavez Ravining shares his own fantasy Baseball cards of the Dodgers. Check them out here. The Bubble machine .gif fantasy card is awesome. Via August Fagerstrom at FanGraphs, "Appreciating Hiroki Kuroda." Kuroda was never the best pitcher in the league; he was never the best pitcher on his team. But he wasn’t supposed to be. What he was, was consistent. In an era where pitchers are more volatile than ever, Kuroda was anything but. 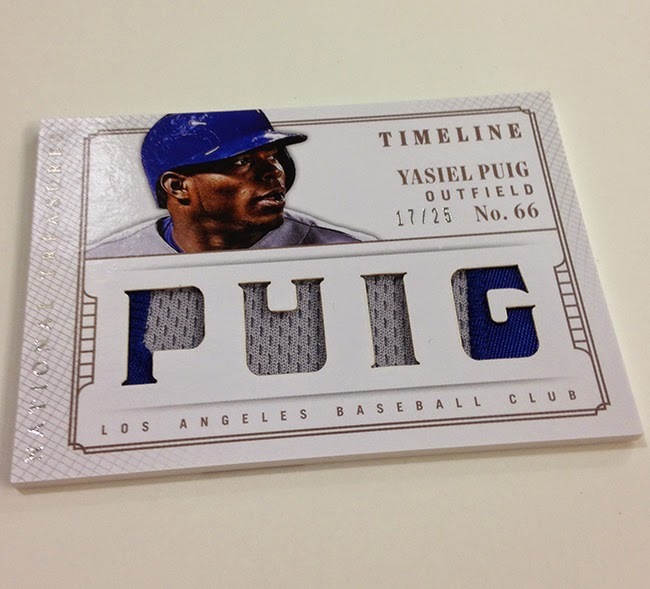 Here are even more preview pics from Panini America's National Treasures Baseball card set, via Chris Olds at Beckett. 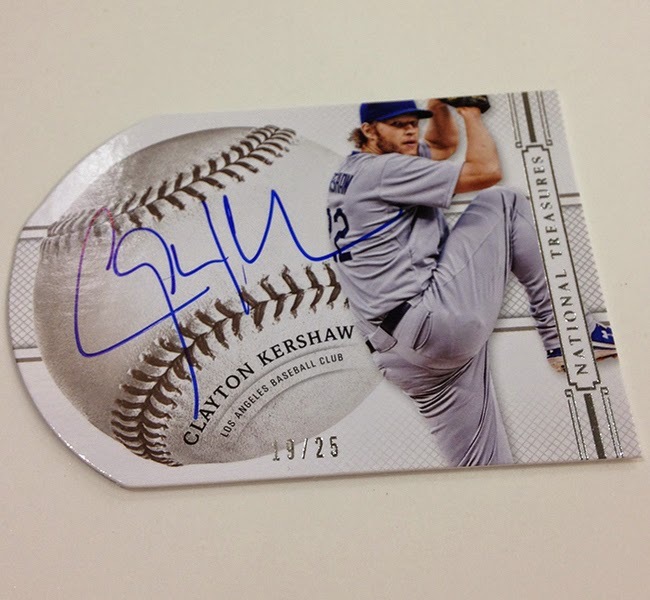 Check out the Kershaw and Puig cards below. Via Eric Stephen at True Blue LA, "Dodgers, Sergio Santos reportedly nearing minor league deal." This is likely a depth move for the Dodger bullpen. Via Jeff Sullivan at FanGraphs, "The Team Projections and You (National League)." His comments about the Dodgers recent makeover keep me optimistic. A fun read. Via William Ryczek at The National Pastime Museum, "Phil Linz and His Harmonica Win the 1964 American League Pennant for the Yankees." But Linz left his mark on the 1964 pennant race as, of all things, a harmonica player—and not a very good one.